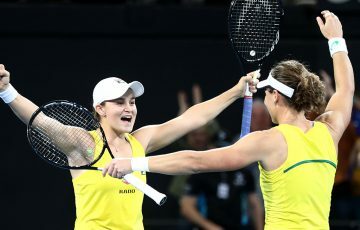 UPDATE 11:10pm: After Ash Barty's stunning Fed Cup singles debut gave Australia a 2-1 lead, Sam Stosur sealed a 3-1 victory over Switzerland in the reverse singles. 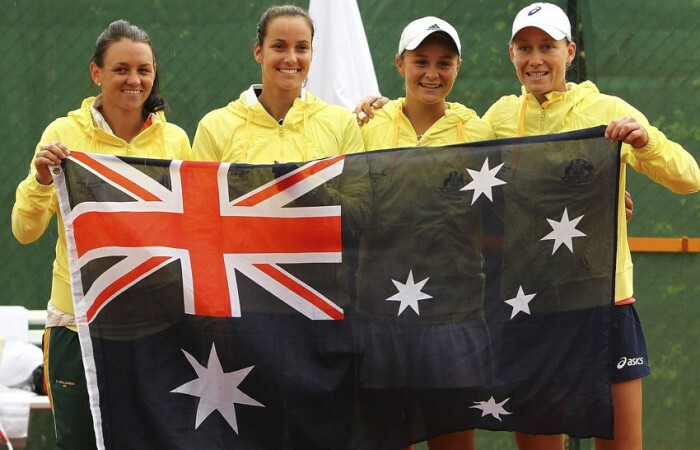 Teenage rookie Ash Barty stepped up to help veteran Sam Stosur guide Australia over Switzerland to secure their place in the Fed Cup World Group. 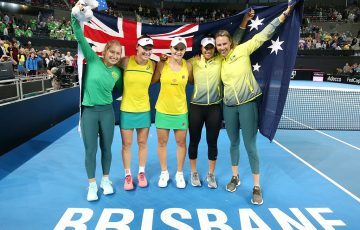 After two days of frustrating rain delays, Australia wrapped up the World Group Play-off tie in one day on Monday, as Stosur scored two victories and Barty triumphed on her Fed Cup singles debut to secure a 3-1 win. The impressive win on clay in Chiasso ensures Alicia Molik’s team will compete in the top eight for the second straight year in 2014. And judging by the performances of Stosur and the promising Barty, their prospects look bright. With the tie locked at 1-1, Molik made the bold decision to name Barty for the reverse singles in place of Jarmila Gajdosova, who had lost her opening clash against top-ranked Swiss Romina Oprandi. But Barty showed composure beyond her years in a classy 6-3 6-4 defeat of Swiss No.2 Stefanie Voegele, ranked 141 places higher at 56. Stosur led Australia superbly, securing two straight-sets wins in the space of three-and-a-half hours as the rain-soaked tie was crammed into a day and matches were played simultaneously. She wrapped up the tie with a 7-5 6-3 win over Oprandi after earlier crushing Voegele 6-0 6-4. Importantly there were no signs of the lingering calf problem that has troubled her in recent weeks. Follow all the post-tie coverage on Twitter at @TennisAustralia.